The Wright Brothers National Memorial is a 60-foot pylon, styled after those used for airplane races, constructed of gray granite blocks. It honors Wilbur and Orville Wright and marks the site of the glider flights that preceded their first powered flight. The design on two sides of the shaft gives the impression of giant bird wings uplifted as if for a take-off, an effect heightened at night by flood lights projected from the five points of the star shaped base. 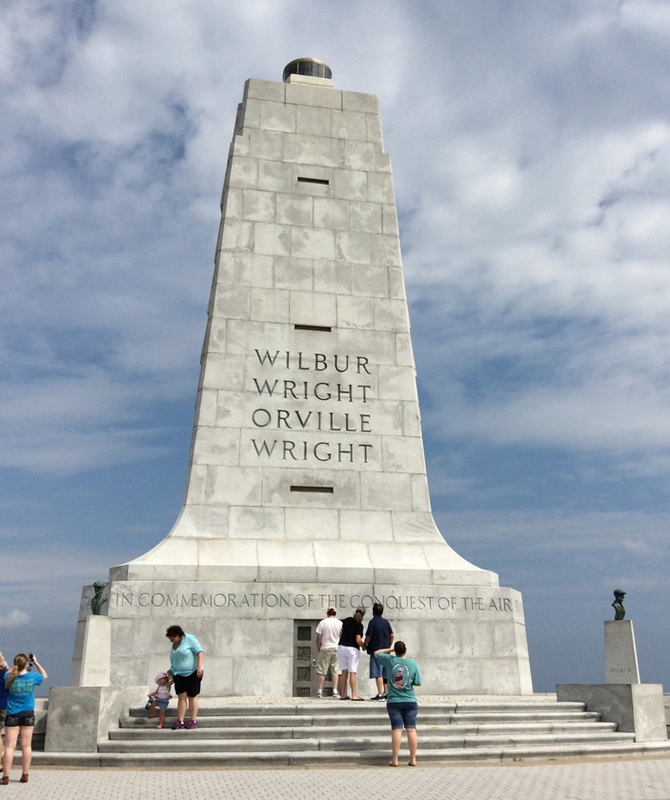 On either side of the staircase entrance leading to the observation deck are reproductions of bronze busts of Orville and Wilbur Wright (see Subject Notes). The bust of Orville is on the proper right; the bust of Wilbur, on the proper left. The pylon crowns Kill Devil Hill, a 90-foot dune of once shifting sand that has been stabilized with grass. When constructed the monument also served as a beacon for aerial and marine navigation. The surrounding park has a reconstructed shack and hanger of the brother’s camp and historical story boards along with cairns marking the site of the first flights. The monument underwent a total renovation sponsored by the First Flight Foundation in 2008. 20 thousand spectators were expected but only a thousand showed up on a stormy, windy day. The gale became so strong at one point the ceremony had to be halted for half an hour and many counted as present never left their automobiles. Orville Wright was the main guest of honor at the ceremony but did not speak. The famous female aviator Ruth Rowland Nichols was given the privilege of removing the American flag that covered the word "GENIUS" and the plaque on the monument. A fleet of seaplanes and other aircraft flew over as the monument’s beacon was lit for the first time. The “great” dirigible “Akron” was scheduled to fly over but grounded because of the high winds. The memorial park was authorized as “Kill Devil Hill Monument” on March 2, 1927; it was transferred from the War Department to the National Park Service on August 10, 1933. Congress renamed it and designated it a national memorial on December 4, 1953. The busts of Orville and Wilbur Wright were originally sculpted by Oskar Hansen (1892-1971), who is most often associated with sculptures located at the Hoover Dam. Both busts went missing, were vandalized and recovered in July 1985. They were stolen again in April 1987 and recovered in October 1989. In 1987, copies of the busts were made by Sheidow Bronze Corporation, cast from a duplicate set located at the Wright Patterson Air Force Base in Dayton, Ohio. The reproductions were placed in honor of Paul Garber who was the first head of the National Air Museum of the Smithsonian Institution, in Washington, D.C. 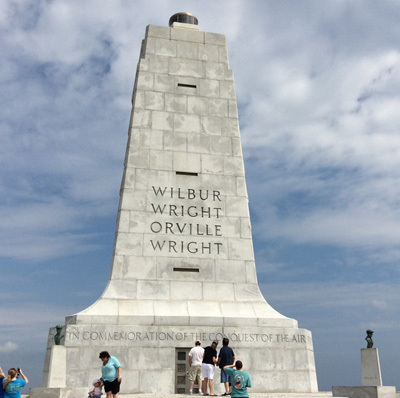 The Wright Brothers Memorial National Park is located on the Outer Banks of North Carolina at Kill Devil Hills. The park address is 1000 N. Croatan Hwy., Kill Devil Hills, NC. Right to the south of the memorial are First Successful Flight of an Airplane Memorial and markers of four powered flights by the Wright brothers made on the morning of December 17, 1903. The First Flight Centennial Memorial is to its north. The National Memorial stands on Kill Devil Hill (a high mound) overlooking the airfield used by the Wright brothers, visitor's center and park.